Home › About › Ambassador Racing Team › Sara W.
Ultra: "Haven't lost my mind yet!" - Sara W.
Running Highlights: I am fairly new to running races. I ran my first marathon at The Cincinnati Flying Pig in 2011 and finished in 4:06:30. My second marathon was The Cincinnati Flying Pig in 2012 finishing in 3:56:57. My most recent marathon was The Nationwide Children's with a finishing time of 3:43:54. Running with Fleet Feet has taught me that you are capable of so much more than you ever dreamed. I'm not stopping until I reach Boston! Favorite Training Method: In the past, most of my training has been about building up my endurance and getting the miles in. This year, my goal is to start getting faster and lowering my finishing times, so I am going to start adding tempo runs and track sessions into my training. The most important part of any training plan is to be consistent. Just putting on the running shoes and getting the miles. Awards: Best Costume Winner- Reindeer Romp 2013 - dressed as an elf-such an honor! What you gotta say Sara! 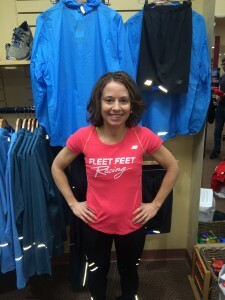 : Being a part of the Fleet Feet Ambassador Team is such an honor. I had always wanted to run a marathon and apprehensively signed up to train with Fleet Feet 3 years ago. I was so scared that I wouldn't finish, that I would fail. Having my coaches, along with my running group, spurred me through the cold winter days and the tough long runs. I am so glad I stepped out of my comfort zone. I will never forget that feeling that swept over me when I crossed the finish line of my first full marathon. Running has truly been a blessing in my life. I am so thankful for the opportunity to help others believe in themselves and reach goals they never thought possible!